The original owners of 135038 were Tony Rainero (me) and Frank Lundgren. Frank and I had sold both of our existing race cars on the promise from Ford Racing that the new 1968 Boss 302 Mustang would ready to campaign for the 1968 Super Stock season. Through late 1967 the Boss car kept being delayed and by early January of 1968 the program was deferred. Up until this time our experience was racing with the small block Ford engine, so when I stated "we don't know anything about this Cobra Jet motor", I was told "you'll figure it out". At this point we were offered and accepted the chance to campaign the new Cobra Jet Mustang. After the cars were manufactured at Dearborn Plant, they were trucked to an impound area at Wixom Assembly plant. Frank and I drove there and assessed the cars in storage. We selected the vehicle we preferred and notified Ford of the VIN number. Ford informed us that it was already allocated to Paul Harvey Ford in Indianapolis IN, who was scheduled to receive 7 of the 50 units. Paul informed our dealer (Stark Hickey) that all 7 had been sold, and indicated we could not have that car. After some tough negotiation between the Stark Hickey owner and Paul Harvey, Paul relinquished that VIN number to a dealer trade (the Stark Hickey Royal Oak owner was the president of the US dealer council). Frank and I flew to Indianapolis with paperwork in hand and took delivery of the Mustang on a Saturday. We then left Indianapolis for Detroit because we were a part of a wedding party that evening. After about 100 miles on the odometer, we decided it was "broken in" and proceeded to do some testing. We did some timed rolling start acceleration evaluations from approximately 40 to 100 mph and after a few tests we observed a car coming on fast in the rear-view mirror. We corrected our speed to the legal limit as a state trooper approached. The trooper shadowed us for a number of miles before reverting to his normal patrol duties. No further tests were performed and we made our wedding commitment. After a wonderful wedding, other attendees wanted to look at the new car. Five people loaded in to the Mustang, and we headed to Telegraph Road where we came upon a young man in a 442 Oldsmobile. At the first traffic light, after dropping the clutch, much to my surprise, severe wheel hop/spring wrap ensued. When I pulled second gear it corrected the problem and the Mustang was gone. When the young man caught up to us at the next light he asked "What is that?" I responded "It's the new HIPO 289!" "Wow" was his only response. 135038 racked up its first win and passed its initiation into racing. That was its one and only street race. It was then garaged, disassembled, and modified to compete in NHRA Super Stock drag racing. The year did not start off well for us with the new Cobra Jet motor. In the first few months we ended up breaking two motors (one which dropped a light weight valve while idling in the staging lanes) and were contemplating sitting out the rest of the season. A friend informed me of a Mercury block that may be available through a warranty return. After the return period ended, we picked up the block and crank. With parts left over from the first two engines which included four .010 and four standard pistons and 8 rods which all needed a little work we assembled our third motor. At this time, I was thinking the clearances Ford was supplying for building these new motors were not correct for the way we were running them, the bottom ends were not holding out. We were trying to get the SPS rod bolts and the Ford "D" cam with no luck. Our dealer, Stark-Hickey Ford, had called on numerous occasions with the part numbers which showed available through Ford but nothing ever materialized. At this point I had to evaluate Ford Motor Company's recommended clearances for the Cobra Jet short block. After assembling this third motor with modified clearances, we took the car to Milan Raceway to test. The current national dragster showed the index to be 11.76. We put 3 or 4 passes on the car which netted a best of 11.77. We had not yet entered the Indy Nationals, due to our previous engine problems, but after our testing felt comfortable enough to enter and NHRA accepted the late entry. By the time we got to Indy and the new national dragster came out and the index was lowered to 11.66 and we were not feeling so confident anymore. Upon arrival in Indianapolis all Ford cars met at the Paul Harvey Ford dealership lot for the evening. The security guard asked for our car number and directed us to a spot in the gravel lane against the rear fence for the night. Frank and I went through the valves and performed other maintenance items. While Frank worked on the car, I went looking for a 5:14 rear gear set. 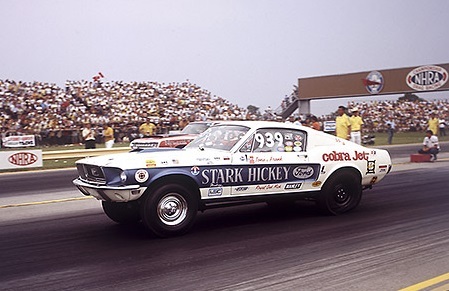 NHRA was now allowing larger rear tires for the super stock cars and while we were still in Detroit we took the Mustang to a body shop and had the rear wheel wells professionally opened for the larger 10.5 or 11 x 29.5 tire. At this time, all the Ford sponsored Cobra Jets were running a 4:86 gear but with the now larger diameter tire being allowed and the fact we always ran higher air pressures (my thought was we had more roll out) and could safely run more rear gear. I was not able to locate any for sale and ended up speaking with Jack Roush who was then running as a member of the Fastbacks. After some debate with Jack, who thought this was too much gear, he agreed to sell me a set so he could watch me blow up another motor. I rejoined Frank and we installed the gear set that evening. Frank and I were in line early for qualifying the next day. Frank asked "What you want me to do? ", to which I replied "There is a pole at around the 1000-foot mark, so run it hard to there, watch the rpm and then ease off". Frank was running against a Corvette and I watched the run which looked good but I did not hear the ET. When I got in the car on return road, Frank showed me the 11.51 time slip. I started to scold him for running the car all the way through, but Frank swore he only ran to the thousand foot and not above 6200 RPM. I was a bit confounded but happily surprised. On the next pass Frank again asked "What should we do?". There was another pole about hundred feet past the first we used as a gauge so I told Frank to run it to there and do the same thing. The next run netted an ET slip of 11.48. I believe we the put a third pass on the car which netted an 11.44. That was the end of qualifying and all cars headed back to Paul Harvey Ford for the night. Again, we were asked by the guard for our car number and were directed to a spot inside the shop. "No, you must be wrong - our spot is by the fence at the back" we replied. The guard reiterated "I just work here and the sheet says you’re inside the shop, don't cause me trouble." This of course gave us access to air tools, lifts, and the nice concrete shop floor. About 10 cars were inside the shop including all the clinic cars, Al Joniec, and of course Paul Harvey's Mustang. There was a young redheaded man kicking up a bit of a fuss about not being competitive unless you had a Holman Moody-Stroppe motor. He was being quite loud when an older gentleman walked up to him to handle his issues. After pointing out that some of the cars running very well were not running Holman Moody-Stroppe motors (pointing out Frank and I), he stated you just have to do your homework. The redheaded man asked him who he was at which time he stated "I am the main engine builder for Holman Moody-Stroppe." This is the first time I met Wally Cartwright. After calming the young man down, he came over to complement us on how well our car was running and asked if I would like to discuss engines. We spoke back and forth and I did tell him that I thought the clearances that Ford was using to build these engines were too loose and how I was now setting my clearances up. We developed a good friendship and a very much respected his knowledge on the Cobra Jet motors. The next morning it was time for class eliminations. We noticed Al Joniec was pulling up next to us. We figured they are going to try to knock us out early since he was the fastest Cobra Jet at that time. Frank and I had spoken the night before that the car was not running out of RPM so if we needed to, we should be able to run it all the way through. We decided unless Al broke that's what we would need to do. Frank beat Al by roughly half a fender and ran an 11.38. Before class eliminations ended, weather stopped any further runs with three cars remaining: Paul Harvey's car, Dave Lyle, and Frank and I. Unknown to me Ford racing representatives took Frank aside for a talk. NHRA had already stated the final runs in eliminations would set the new index for the class. Ford, besides running for the manufactures cup with the factory supported cars, did not want the index lowered by the amounts the cars could run under the existing index. Frank spoke to me of his conversations with the Ford racing representatives. I was unhappy with Ford trying to manipulate how we were racing when in my mind they were giving us no support even after promising help. Frank urged me to just listen what they had to say. After speaking with the representatives and being able to voice my opinions on lack of support for independents to the point of withholding parts, I was promised if we agreed that would no longer be an issue and we would receive factory backing. After asking how they would like us to proceed we were told the three of you have to figure it out. Other than one of the factory cars would have to win, the rest was up to us. We ended up pitching pennies to determine the running order. Jerry would win with the Paul Harvey car, Dave would be runner-up, and we would lose to Dave. I was still unhappy with the factory influence but would honor the agreement we made. On the run I told Frank to run it hard through third gear then throw it into neutral as you had missed a shift and rev it up. Frank was out on Dave but we followed through with the plan and lost. As it turns out at tear down the Paul Harvey car was disqualified for having under cc heads. Dave also failed tear down for an incorrect block. Frank and I not knowing the rules very well headed for the tear down barn where we were turned away as only the winner and runner-up were checked. There was no SS/F class winner at Indy in 1968. After Indy, Ford was working closer with me and they informed me that a 1970 Mustang would be available if I was interested. This would include access to the parts crib for miscellaneous parts to build and run the 1970 Mustang and support the 1968 Mustang. We continued to receive sponsorship from the Stark Hickey dealership for both cars which is why we ended up painting the 1968 Mustang Royal Maroon with Boss style stripes to match the 1970 Mustang, less the multicolored fade on the hood. Within weeks after Indy, we were racing at Lapeer Dragway where they held a Super Stock shootout. About 25 cars showed up for the event which was quickly cut down to three Chryslers (including the late John Tedder) and our 135 car. We ended up winning the event running an 11.22, but were told by the track owners, the Vakula Brothers, that we had been protested. I joked "Those Chrysler guys aren't very good losers", to which the track operator said it was not them. Of course, there were some Chevrolets that did not make the finals and that was my next guess. Wrong again, the operator told me, you have to look a little closer to home. Yes, we were protested by another Ford racer! After we tore down and were found to be legal, we still couldn't believe another Ford racer would protest. Later we found out this racer said no legal 428 could run that fast. Now the part that most of you are waiting for, what I know of what happened to 135038. Frank was in the Navy reserve at the time and informed me he was changing to active duty. He asked for his share out of the 1968 Mustang as we had purchased it together. I could not run both cars and as the 1970 had been solely given to me by Ford it made sense to sell the 1968. We sold it as a rolling chassis to the Ulrey Brothers in 1971. I believe at least for a time they ran it with a 428 in Super Stock, but I have seen information that they also may have run it in Modified Production with a Boss 302. Some years after we sold the car, I thought about buying the car back and restoring it. I contacted Marty Barrett (division 3 tech man), who I knew was good friends with the Ulrey Brothers. He informed me of an accident involving their ramp truck in which the Mustang flew off the truck and was a total loss. Marty also advised me the accident had occurred in Indiana and state laws mandated the car be destroyed and legal consequences could result by trying to re-title the Mustang if it were to still exist. I do not know if this was its ultimate fate but I gave up my pursuit to find and restore 135038.